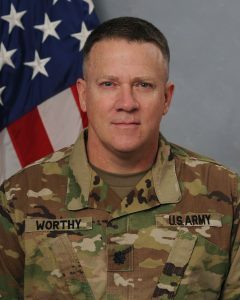 SCI's David Worthy Assumes Battalion Command - SCI Technology, Inc.
On Sunday, November 5, 2017, SCI Technology’s David Worthy was pinned as a Lieutenant Colonel with the Alabama Army National Guard. In addition, David assumed change of command at Ft. McClellan in Anniston, Alabama, as Battalion Commander, 2nd Battalion (Officer Candidate School), 200th Regiment. David has served his country for more than 27 years, having begun his career in the Alabama National Guard in 1990 as a Private First Class (PFC) Armor Crewman, M1 Tank driver. He has been a gunner and was later a Staff Sergeant, M1A2 Tank Commander. Prior to becoming an officer, David attended the Alabama Military Academy (AMA) Officer Candidate School (OCS). In 1999, David was commissioned as an Armor Platoon Leader and later branch transferred to MP and took command of an MP Company shortly before being deployed to Iraq. He was blessed with a great team of soldiers that got the company in and out of Iraq with no injuries or loss of life. Most recently, David has worked at the 226 Maneuver Enhancement Brigade (MEB) in Mobile, Alabama, as the Chief of Operations. With his most recent promotion, David stepped into Battalion Command at the AMA OCS. In his duties with SCI, David serves as Senior Systems Integration Lead. He joined the company in January of 2017. SCI extends its congratulations to David and his family! 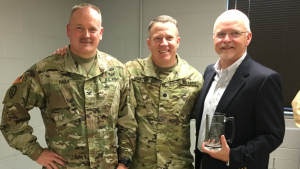 David Worthy (center) is pictured with Colonel Curtis Faulk, National Guard 200th Regimental Commander, and Kevin Duke, SCI Vice President, Tactical Systems.